Leading Marxist Manning Marable Dies - Once Wrote, Obama "Has Read Left Literature, Including My Works"
One of America's leading academic Marxists, Director of the Institute for Research in African-American Studies, Columbia University, Manning Marable, has died, aged 60. 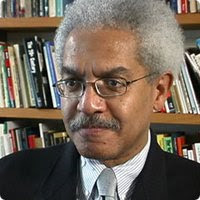 One of the most influential black radicals of his era, Manning Marable was both activist and academic, playing leadership roles in several Marxist organizations and authoring numerous books and articles, including a soon to be released biography of Malcolm X .
Marable even claimed the President of the United States Barack Obama as one of his readers. In the December 2008 issue of British Trotskyist journal Socialist Review Marable wrote. One of Marable's first confirmed radical affiliations was with the 1970s Marxist group New American Movement, founded mainly by veterans of the Students for a Democratic Society and the Communist Party USA. Marable's wife Leith Mullings (Feminists for Peace and Barack Obama) comes from a Communist Party background. Marable was an early member of Democratic Socialists of America after it was founded in 1982 and by 1984 was a D.S.A. vice chair, alongside the likes of far left Democratic congressman Ron Dellums, San Francisco Board of Supervisors member Harry Britt and Washington DC City Councilor Hilda Mason. Like many socialists Marable was happy to work with communists. In November 1989 he addressed the 10th anniversary conference of the Communist Party controlled U.S. Peace Council, alongside two well known D.S.A. affiliates, Michigan Congressman John Conyers and his Vermont colleague Bernie Sanders. Marable was an almost annual speaker at D.S.A's Socialist Scholars Conferences in New York - which Barack Obama is known to have attended in the early 1980s. In 1992, a new Marxist organization Committees of Correspondence was formed when a third of the Communist Party broke away to link up with DSAers, Trotskyists, Maoist, leftist Democrats and anarchists in an attempt to modernize and broaden the U.S. left. Marable became a co-chair of the new coalition. Through C.O.C. Marable got involved in the LINKS network. This was an Australian based publication designed to link the Cubans, former East German and third world communists with Trotskyists and Maoists, black radicals, anarchists and "green" activists to form new leftist parties in several countries based on the model of the very successful (and now ruling) Brazilian Workers Party. Interestingly President Obama has worked to forge strong ties to the Brazilian Workers Party leadership since assuming office. In 1994 Marable was one of many D.S.A. and C.O.C. activists behind the New Party - a crypto socialist grouping aimed at nudging the Democratic Party to the left. While it didn't last long the New Party helped propel its best known members Barack Obama and DSAer/Democrat Illinois Congressman Danny Davis onto the national stage. In June, 1996 Manning Marable led a delegation of fifteen prominent African Americans to Fidel Castro's Cuba . Members of the delegation included Marable's wife : Leith Mullings , Professor of Anthropology, City University of New York; writer/editor Jean Carey Bond; political theorist Clarence Lusane; Columbia University Chaplain Jewelnel Davis; and DSAer Michael Eric Dyson, Visiting Professor of African American Studies, Columbia University. During Marable's Cuba sojourn, he met many government officials, intellectuals and community leaders who as well as having a lengthy conversations with Assata Shakur aka Joanne Chesimard an escaped terrorist cop killer from the U.S. In the late in 1990s Marable joined activists from D.S.A., C.O.C., Communist Party USA and other Marxist groups to found the Black Radical Congress. There is no evidence that Barack Obama attended the B.R.C. 's founding conference in Chicago in June 1998, but Obama's Marxist pastor Rev. Jeremiah Wright as certainly there, as was future Obama "Green Jobs Czar" Van Jones. On October 30 and 31, 1998 the radical Brecht Forum celebrated the 150th Anniversary of the Communist Manifesto" at Cooper Union's Great Hall, New York. Individual endorsers of the event included Manning Marable. 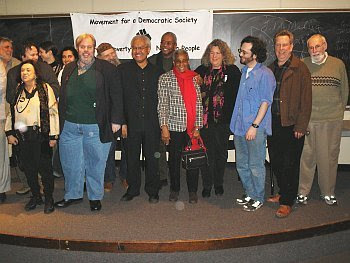 In 2006 -7 several radical groups including D.S.A., C.O.C., Communist party USA and several former leaders of the terrorist Weather Underground including Jeff Jones, Mark Rudd, and Obama allies Bill Ayers and Bernardine Dohrn to form a new radical umbrella organization Movement for a Democratic Society. MDS February 2007. Mark Rudd far left, Jeff Jones, second from right, Manning Marable, center. At M.D.S. 's February 2007 meeting in New York, Marable was elected Chair of the new organization. M.D.S. never really did take off, but it did last long enough to spawn an offshoot Progressives for Obama, in time for the 2008 Presidential election. Manning Marable packed a lot of Marxism into his 60 short years. His socialist legacy lives on on countless University campuses and political movements across the across the nation - even in the Oval Office itself. This is so sad, he was one of the great intellectu¬als of this nation, RIP Comrade. Democracy Now did a great story on him and his life's work this morning. He will be sorely missed. The problem with leaving history to some of the historians is that they, too, can be corrupted by the need for acceptance in media/publishing/academic circles in order to get published. What TL at New Zeal has done is bypass the MSM to bring us the unvarnished truth about what is going on across America and the world as Communism marches on. It is too bad that Fox News doesn't take the archive of information here and make half-hour or hour-long programs featuring just the documented facts about the Communist presence here in America in our media, universities, government, social/environmental/judicial activism spheres. We all owe you a debt of gratitude for bringing this information to awaken the slumbering public. Muslim Students Association Pledge of Allegiance.